On Wednesday 24 August 2016, a Mw 6.2 normal faulting earthquake struck the Apennines region of Italy. 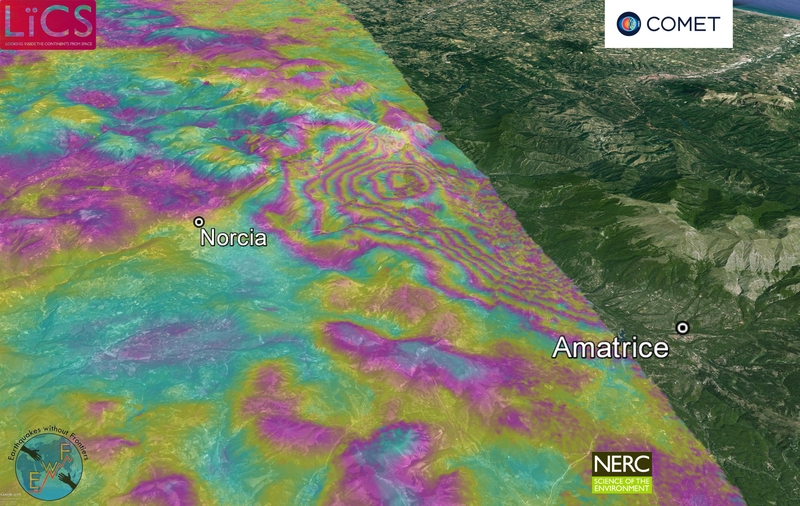 Sentinel-1 data has been acquired over the region and is being used, along with other radar data, to help focus field investigations of the active faulting in the area between Amatrice and Norcia. Sentinel-1 interfergram of the ground deformation around Norcia and Amatrice due to the 24 August earthquake. The Sentinel-1 interferograms are available to download as a kmz file overlay in GoogleEarth for the descending here and for the ascending (with more complete coverage) here . On 27 October, the initial earthquake was followed by a major aftershock along strike to the north-west. With the relative rapid return of Sentinel-1 data, it was possible to generate a coseismic interferogram within one day showing the ground displacements. This data showed that the earthquake slip area was very shallow but that the rupture extends along strike for 14 km. The information has been used to direct field teams to investigate the possible presence of a ground rupture. This Sentinel-1 interferogram is available to download here as a kmz file overlay in GoogleEarth. Click on the image below for a high-resolution jpeg. A further Mw 6.6 earthquake struck the Apennines on 30 October. COMET scientists are continuing to analyse the latest ground deformation and surface faulting between the towns of Amatrice, Norcia and Visso. The latest Sentinel-1 interferogram shows major ground subsidence and complex deformation patterns, and is available to download here. Sentinel-1 interferogram covering the deformation of both the Mw 6.6 30 October and the Mw 6.1 27 October earthquakes.